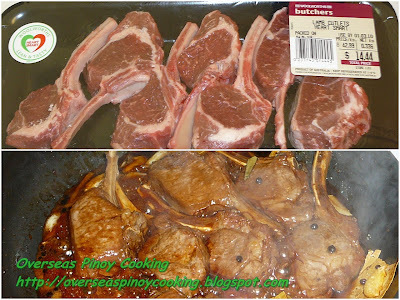 Lamb Chops Adobo, lamb is one popular meat here in Australia, and they are readily available. To most Pinoys lamb is it probably the last choice of meat. This is for the reason that lamb has that pungent aroma “ma-ango”, especially the meat from older lambs, and these are the type of lambs that are sold in the Philippine market. If prepared right lamb is a great meat, the meat is sweet. Personally I learned to love lamb. I have tried lamb from shwarma, roast, curry to grilled. To those who like lamb I would like to share my lamb adobo that I have prepared for today’s dinner. I have chosen trimmed lamb chops, the fats have been removed, all that is left on the chops are lean meat. Discarding the fats also reduced the “ango” taste and aroma. In a deep frying pan quickly sauté garlic, ginger and hot chili flakes add in the peppercorn, bay leaf and lamb chops stir cook for 2-3 minutes or until the lamb chops turns to golden brown. Add in the vinegar and soy sauce. Simmer for 3-5 minutes or until the sauce is reduce to almost dry, occasionally turn over the lamb chops. When done arrange the lamb chops in a platter pour over the sauce and top with the fried crushed garlic. Serve immediately.